For those already working with WebSphere Integration Developer, WebSphere ESB, or WebSphere Process Server, or those considering using them, you might be interested to know that version 7.0 has just been announced and is scheduled to be available around the end of Q4 2009. Service Federation Management between WebSphere Services Registry and Repository and WebSphere ESB. Exploitation of WebSphere Application Server V7. Improved Service Gateway scenario support. Event sequencing support in WebSphere ESB. Note the use of Plan rather than Transition1. Thanks to Steve Groeger and Martin Smithson for their help with this tip. Let’s say you want to use the Endpoint Lookup primitive in WebSphere ESB to lookup an endpoint stored in WebSphere Services Registry and Repository (WSRR), but matching against the governance state of the endpoint. For example, you might want to only lookup endpoints which are in the ‘Managed’ state – i.e. they are deployed and ready to work with. How would you do this? Well, in WebSphere ESB, when you’re specifying the properties of Endpoint Lookup primitive, you get the ability to specify Classifications. These are matched against Classifications in WSRR – including the governance state. Now, when the lookup is performed, only endpoints in the Managed state will be returned. Note: The classifications are logically ANDed together: if you specify multiple ones, the endpoint must match all of the classifications. Thanks to Andrew Borley, Bernard Kufluk and David Bell for help with this tip. I’m pleased to report that IBM has officially announced WebSphere Enterprise Service Bus 6.1, the product my colleagues in the development team are currently working on. 6.1 versions of its sister product WebSphere Process Server, the associated tool WebSphere Integration Developer, WebSphere Message Broker, and the WebSphere Service Registry and Repository have also been announced. Please see the announcement letter for more information. 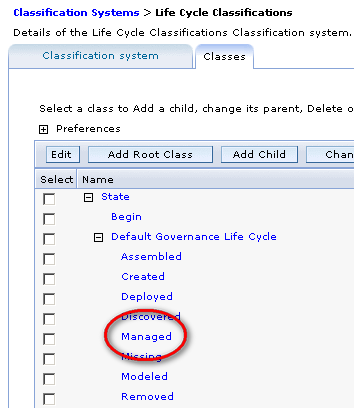 If you have a secured instance of WebSphere Service Registry and Repository and you want to use the Endpoint Lookup mediation primitive to use this instance to determine which endpoints you have available, then you may want to check out this technote which describes the configuration steps necessary and an iFix you will require if you are on the 6.0.2.0 level of the WebSphere ESB or WebSphere Process Server. WebSphere Service Registry and Respository is a service metadata repository which can be used to store artifacts such as interfaces (WSDL), business objects and XML structures. If you are developing modules/mediation modules (inside WebSphere Integration Developer) using these artifacts then you will want to be able to import these artifacts directly. The guidance on how to configure WebSphere Integration Developer to connect to WebSphere Service Registry and Repository and how to discover artifacts can be found here in the Information Center.